Dealing with WorkCover Queensland, a self-insurer or a superannuation provider can be a stressful and complicated process. That is why our goal is to allow you to focus on recovering from your workplace injuries by handling the workers’ compensation claim process as quickly and cost-effective as possible. My Work Injury Lawyers will be by your side throughout the compensation claim and assist you with every step of the process. If you need to make a workplace injury claim, we can help. 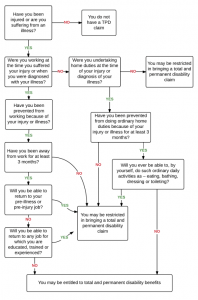 Should I report an injury at work? Most workplaces have an injury reporting procedure and it is best to ask your supervisor to ensure you can follow the correct procedure. Otherwise, it is best to report a workplace accident or injury to your supervisor as soon as possible. Alternatively, if your workplace has a first aid officer or human resources manager, report it to them. This is important so you receive the right treatment for an injury, but also to make sure there is a record of the accident or injury happening. This can be very important later in the claim process. After an injury at work, you must make an Application for Compensation to WorkCover or directly to your employer (if they are self-insured) within 6 months of the injury. There is a risk that you could lose your right to claim workers’ compensation if you do not make your application in time. There are certain cases where you will be allowed to lodge your Application for Compensation after 6 months, but it is essential to get legal advice. The most important time limit for a common law claim explained below, is the 3 year limitation period. You must have lodged your Common Law claim and have it accepted by WorkCover or the self-insurer within 3 years of your work injury, otherwise you will lose your right to compensation. There are limited situations where a Court may extend this period, but it is very important to get legal advice well before then. Before you can start any Court action, there are generally 2 major steps that have to be taken – Statutory process/claim and the Common Law claim. What is the Statutory process/ claim & Common Law claim? The Statutory claim is usually the first step in a workers’ compensation claim process. In Queensland, we have a ‘no-fault’ system, which means anytime you are injured in the workplace, you can apply for workers’ compensation. In the Statutory claim, injured workers are covered for medical/treatment expenses and a portion of their wages. You may have heard the terms “negligence claim” or “breach of employer’s duty of care”, those are often terms used to mean a Common Law claim, which is usually the second step. To succeed in a Common Law claim you must prove that your employer has been negligent and this caused your injuries (called “liability”). You must also prove what injuries you have suffered and how this has affected you financially (called “damages”). Unfortunately, many injured workers have not yet fully recovered when WorkCover or a self-insurer cuts benefits in a Statutory claim. You may still have ongoing pain and suffering, you may not be able to return to your previous job, what happens then? That is where a Common Law claim may assist, to put you in the financial position to afford future treatment and to cover your loss of wages. It is best to talk to a lawyer about your legal right to compensation for personal injuries as soon as possible after an accident at work or a work injury, because of the limitation periods and because every case is different. Generally, a Common Law claim can only be commenced once you finish the Statutory claim process and after WorkCover or the self-insurer has issued a Notice of Assessment. What is a Notice of Assessment & Lump Sum Offer? When your benefits are cut by WorkCover or the self-insurer, you should be issued with a Notice of Assessment. This is a document which sets out your injuries, expressed as a percentage. The Notice of Assessment may also contain a lump sum offer of money. It is very important that you do not accept any lump sum offer made, otherwise you could lose your right to claim Common Law damages. Please call My Work Injury Lawyer for advice as soon as you receive a Notice of Assessment and lump sum offer. I am having difficulties with the WorkCover process, what should I do? Sometimes you may not understand the process, you may disagree with a decision by WorkCover or a self-insurer or might have other difficulties with the WorkCover process. As a first step, it is generally best to talk to your WorkCover claims officer. However, if you are still unsure, please call My Work Injury Lawyers and we can give you some initial free advice. How long will my workers’ compensation Common Law claim take? How WorkCover or the self-insurer deals with your claim. After your Statutory claim is finished and you are issued with a Notice of Assessment, your Common Law claim will usually take approximately 9 – 12 months. My Work Injury Lawyer will keep you up to date throughout the compensation claim process and we will work with you to move the claim along quickly. How much compensation can I claim for my injuries? If you have to take time off work after your injury to recover, you will be able to claim for the wages you lost while you were away from work. While on WorkCover, you will only be paid a portion of your wages and there is likely to be an extra loss which you can claim. Unfortunately an injury may cause you long term difficulties, which can then affect your ability to return to work to the same level as before the accident. A claim can be made for your future loss of income. After a work injury you might pay for medication (e.g. panadol, nurofen etc…) or treatment (e.g. GP, massage, physiotherapy, x-rays etc…). You can claim those expenses back in the Common Law claim. If the doctor recommends you should have some treatment or take some medication in the future because of your injuries from the work accident, then you can claim these future medical expenses. You can claim a limited amount of compensation for the pain, suffering and impact of an injury on your life. Unfortunately, this is now strictly limited by law, so it is best to talk to My Work Injury Lawyer. In some cases, there can be other costs that you can claim including equipment (e.g. wheelchair, exercise balls, TENS machine, catheters etc…), paid care and assistance (e.g. lawn mowing or gardening services, Blue Care etc…) and sometimes even the time that family and friends provide you with care and assistance. We're a cost effective solution for parties needing to make a viable compensation claim. The first consultation is completely free and obligation free, with further fees only paid if your claim is finalised by us. Are there costs associated with an initial consultation? What costs are involved after the initial consultation? My Work Injury Lawyer work on a ‘no win, no fee’ basis when you make a common law, or other, claim. You do not pay any legal fees until and unless your claim is finalised by us – either by settlement or a Court decision. Along the way we will also pay for legal outlays, such as medico-legal assessment fees, Court fees and other outlays that may be necessary to progress your work injury claim or other. Unlike some other legal firms, My Work Injury Lawyer will also pay these outlays on a ‘no win, no fee’ basis. So, if your claim with us does not succeed, you do not pay anything to My Work Injury Lawyer. You do not have to pay any expenses we incur in that case. If you go to Court and lose, you may, however, be ordered to pay WorkCover’s or the self-insurer’s legal costs. That’s why you should talk to our worker’s compensation lawyers, Brisbane & beyond. If you have superannuation, then you will likely have total and permanent disability (TPD) insurance. Our lawyers can tell you what that means and how it relates to your circumstance in the event of an accident. What is Total & Permanent Disability (TPD)? TPD is a type of insurance. It covers you if you cannot work because of illness or injury. It commonly comes as part of your superannuation. How does Total and Permanent Disability insurance work? When you have a superannuation account, your superannuation fund will buy TPD insurance from an insurer. This is called group insurance cover. The insurance will then apply to some or all of the super fund members, like you. The TPD insurance policy is a very important document, because it determines whether or not you are eligible for TPD cover and what you have to prove to successfully claim TPD benefits. Am I eligible for Total and Permanent Disability benefits? If you weren’t working at the time of your illness or injury, but were doing home duties, then after your illness or injury you cannot return to doing certain activities of daily living, e.g. dressing. Is there a waiting period to access Total and Permanent Disability insurance? Yes. Most TPD insurance policies have a waiting period of between 3 months – 6 months. You must show that you have been unable to undertake work or your ordinary home duties for between 3 months – 6 months, before you can claim TPD benefits. How long does it take to make a Total and Permanent Disability Claim? Whether the superannuation fund requires any other evidence to prove your claim. Depending on these factors it can take anywhere between 6-18 months for finalise a TPD claim.